In a twist of irony that can simultaneously bring a tear and a smile to lovers of Barnegat Bay, New Jersey’s osprey population hit what may be a record high in 2014, the same year bay conservationist legend Paul “Pete” McLain and noted local veterinarian Dr. Stephen Wurst passed away. The two men, as well as Wurst’s son Ben, were instrumental in helping the osprey population, once devastated by the effects of pest-killer DDT, rebound in New Jersey to levels that have not seen in years. The New Jersey Osprey Project this week said in 2014, 686 young were produced from 339 known-outcome nests, with 526 young being banded. 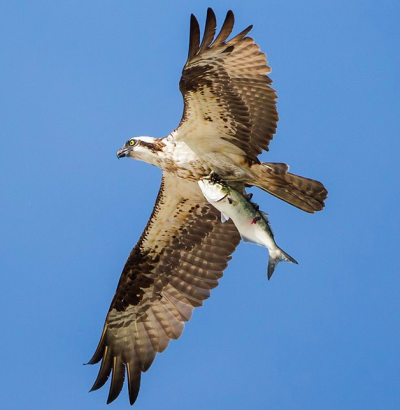 The numbers represented an all-time high for the state’s osprey population. When the osprey surveys started in 1973, there were only 53 nesting pairs. In 2013, there were 542. The surveys are undertaken by a dedicated group of state biologists and volunteers who scour the coastal areas of the state in search of nests. They target the most densely-populated osprey colonies from the Meadowlands to Cape May, and out west along the banks of the Delaware River. Along the way, samples of each area are taken to see how the birds are doing, and nestlings are fitted with small bands provided by the U.S. Geological Survey so they can be tracked over time. Most nests produced about two nestlings, though nine produced four, a staggering number, volunteers reported. Fortunately, bunker, the osprey’s main food source, remained plentiful this year despite a hefty amount of fishing pressure, the report said. The Barnegat Bay area of the state, including the Sedge Island management area off Island Beach State Park, had among the state’s largest number of ospreys in a given locale. There were 53 nests in the bay region and 25 in the management area along, which produced a combined total of 80 young. Of those, 57 were banded so they could be tracked. Combined, there were 354 nests along the Atlantic coast and 53 along Delaware Bay. The Barnegat Bay watershed, from Point Pleasant to Little Egg Harbor, is also home to a new banding system that seeks to engage “citizen scientists” to allow birders and wildlife photographers to identify the birds of prey over the long haul. The new band, which is a red anodized aluminum rivet band, bears an alphanumeric code which can be keyed in online after a sighting to provide data on dispersal, foraging habits, site fidelity, migration routes, and life span, the group said. The annual report, penned by Ben Wurst, was dedicated to McLain and his father this year, he said.